NCAL is a non-profit organization that helps adopt out rescued pets. Sterling Ridge Resort has a dog-friendly environment and a high percentage of guests have given forever homes to rescue dogs. NCAL’s mission is “to promote compassionate and responsible relationships between humans and animals.” Through adoption, education & outreach programs, spay/neuter programs, support of cruelty prevention and sheltering of homeless animals they are making a difference in the pet community. At Sterling Ridge Resort we are excited, along with our dog ambassadors, Rocky and Max, to welcome walkers and runners to this 5k event. Our hope is that we will raise funds for NCAL to help continue making a difference in the community and make 5k Goes to the Dogs at Sterling Ridge a yearly event. On a final note, we cannot forget to mention Sterling Ridge Resort’s dog ambassadors, Rocky and Max. Rocky is a 7-year-old Coton Du Tulear – a feisty little dog with a big heart. Max, who happens to have his very own Facebook page https://www.facebook.com/pages/MAX-The-Resort-Dog/184165668390989?ref=hl, is a happy senior turning 12 years old. He is definitely the heart and soul of the Sterling Ridge Resort dog community. Both dogs, with their friend Gus (a 7-year-old Shih Tzu), greet each guest with a warm, friendly welcome. 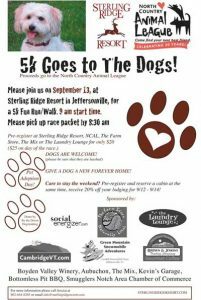 The 5k Goes to the Dogs is a great way for everyone, two-footed or four-pawed, to experience the beauty of Sterling Ridge. Let us know if you would like to sponsor this great event.